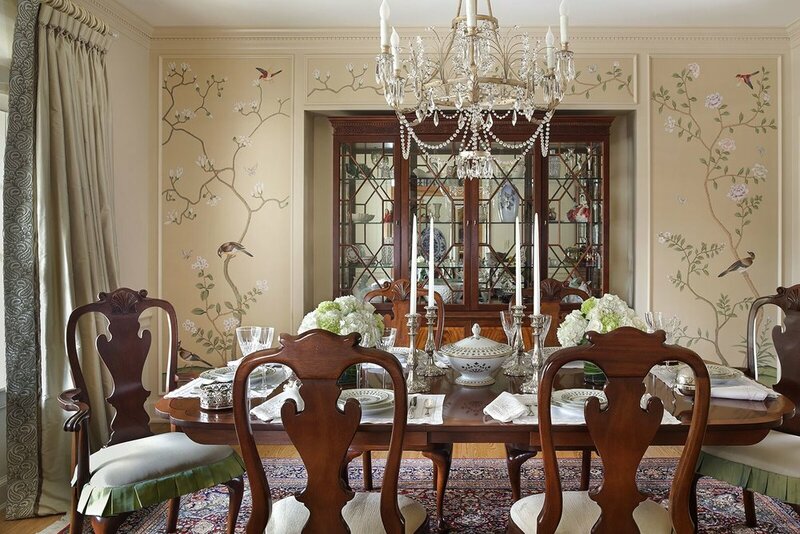 Design inspiration for this high-end, traditional dining room was informed by a study of how to achieve an aura of balance, elegance and artful refinement within the space, as well as ensuring an abundantly sufficient sense of light and the outdoors with only one window. A framed, panelized conceptual treatment of De Gournay hand-painted wallpaper defines the enduring elegance of this room and encases an arresting breakfront that centers the space while beckoning eyes upward and outward, providing both balance and drawing in the natural beauty of the surrounding garden. No detail was left unattended. The custom-colored wallpaper was carefully selected to match and complement the luxurious rug. A gracefully airy light fixture works in tandem with a monotone selection for the paint color to inspire a sense of freshness in the otherwise formal setting. The host and hostess chairs boast delightful box pleat skirts in acid green as one more subtle nuance to help draw in the outdoors and enliven the space with a sense of natural beauty.